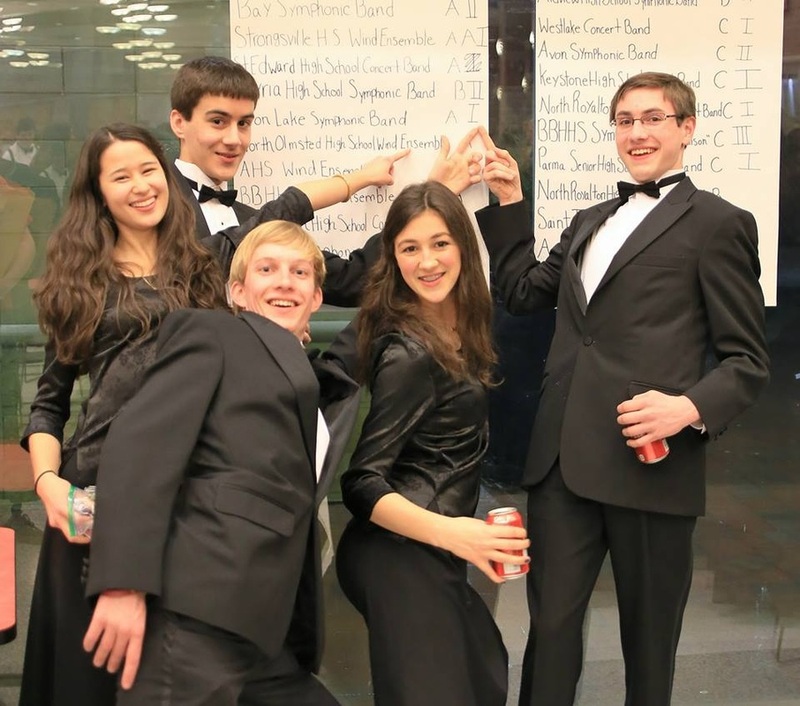 The Avon Lake High School Symphonic Band is recognized as the premiere ensemble in the high school band program. Fifty to sixty students are accepted each year by audition. 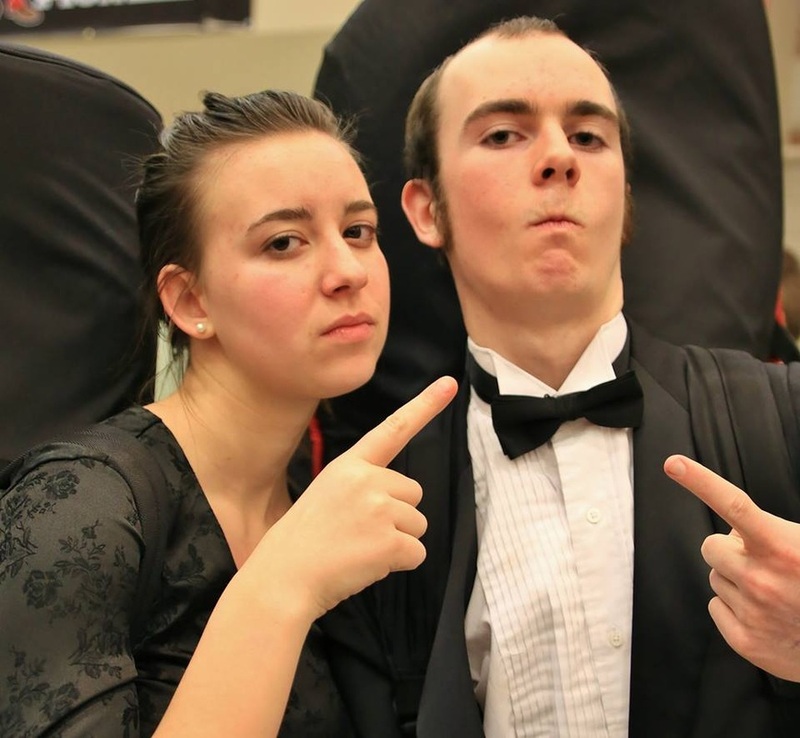 The Avon Lake Symphonic Band is a highly acclaimed ensemble that performs both new and classic literature for winds. 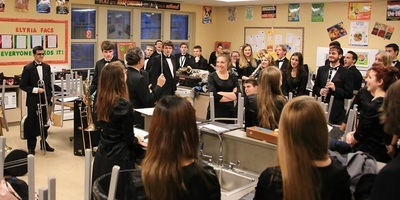 The Avon Lake Symphonic Band was invited to perform at Severance Hall in Cleveland, January, 2011; Orchestra Hall in Chicago, March, 2013; Carnegie Hall in New York, April, 2016; and Orchestra Hall in Chicago, March, 2019. The Avon Lake Symphonic Band performs a wide selection of significant wind symphony and wind ensemble literature. Recent repertoire has included the music of Vasily Kalinnikov, Percy Grainger, John Barnes Chance, Malcolm Arnold, W. Francis McBeth, and Leonard Bernstein. 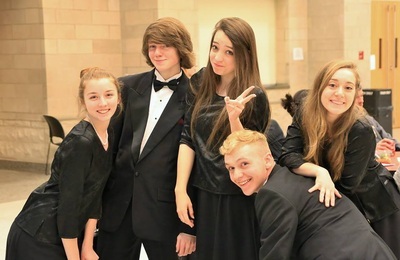 The ensemble has also performed the music of contemporary composers including Eric Whitacre, John Mackey, Samuel Hazo, Robert W. Smith, and Brian Balmages. Nearly half of the students in the Symphonic Band study privately and they all perform at the annual solo and ensemble contest. Numerous members of the ensemble perform with outside groups such as the Cleveland Youth Wind Symphony and Cleveland Orchestra Youth Orchestra. 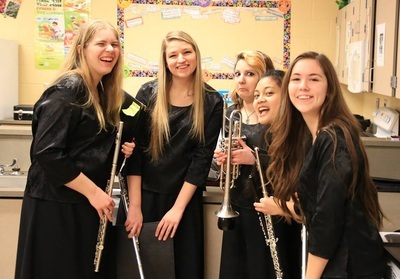 All of these experiences help the students to become well-rounded and mature performers with greater musical understanding and appreciation for quality music. 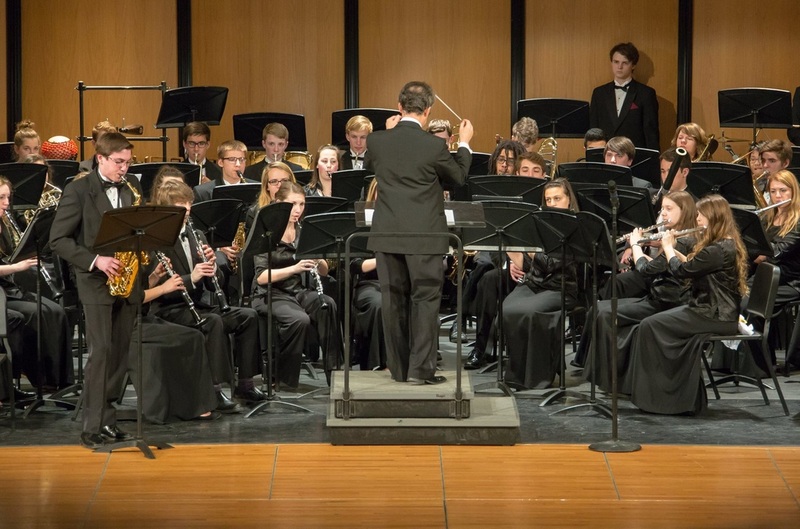 The Avon Lake Symphonic Band performed at the PERCY GRAINGER FESTIVAL at Chicago's Studebaker Theater on March 23rd, 2019! 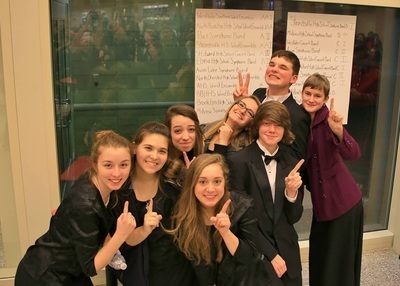 Congratulations to the Avon Lake Symphonic Band. Superior Rating in Class AA at the recent OMEA Contest! 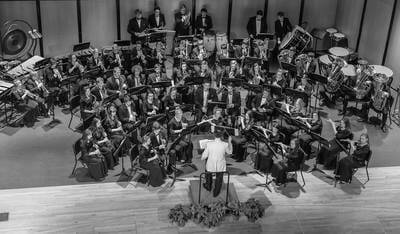 The band performed​ "Overture to Candide" (Bernstein), "Ye Banks and Braes O'Bonnie Doon" (Grainger), and "Of Sailors and Whales" (McBeth). 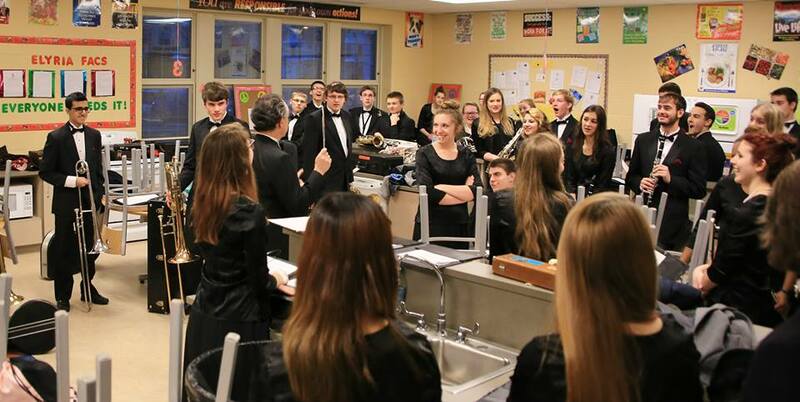 The Avon Lake Symphonic Band performed at the OMEA Large Group Contest on March 10th, 2017 at Westlake HS and was awarded a superior rating in Class AA. The band performed His Honor by Henry Fillmore, Incantation and Dance by John Barnes Chance, and Arabesque by Sam Hazo. Congratulations, Band! The Avon Lake Symphonic Band at Carnegie Hall on April 4th, 2016. 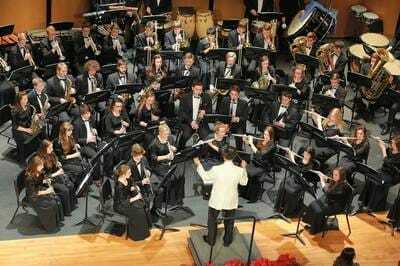 September 4, 2015 - The Avon Lake Symphonic Band was one of six ensembles selected nationwide to perform at Carnegie Hall in New York City on April 4, 2016. 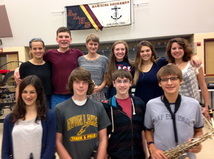 The 58 member group is the premiere ensemble in the band program at Avon Lake High School. The band has performed at Orchestra Hall in Chicago (2013) and at Severance Hall in Cleveland (2011). Click HERE for more about this exciting trip. 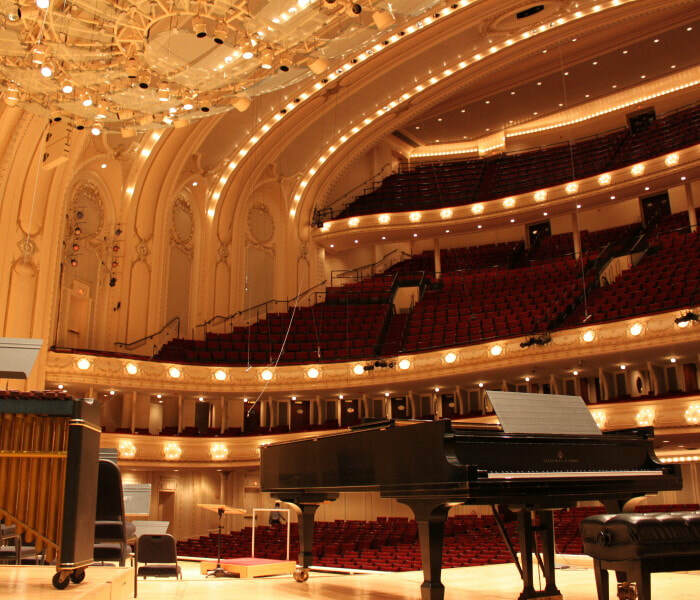 ALHS Band Director David Eddleman, Col. Arnald Gabriel, and Dr. John Knight at Symphony Center in Chicago, March 2013. 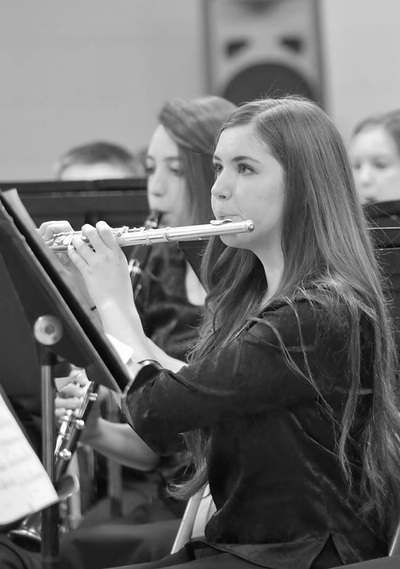 The Avon Lake Symphonic Band takes the stage this Saturday night, May 3rd, 2014 at 7 PM in the Avon Lake Performing Arts Center. The 50 member ensemble will play the Overture to Candide. 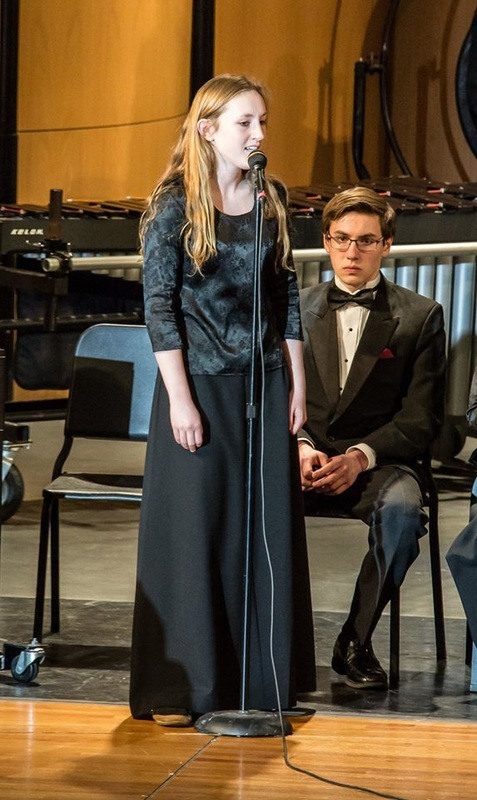 Candide, first performed in 1956, is an operetta with music composed by Leonard Bernstein, based on the novella of the same name by Voltaire. 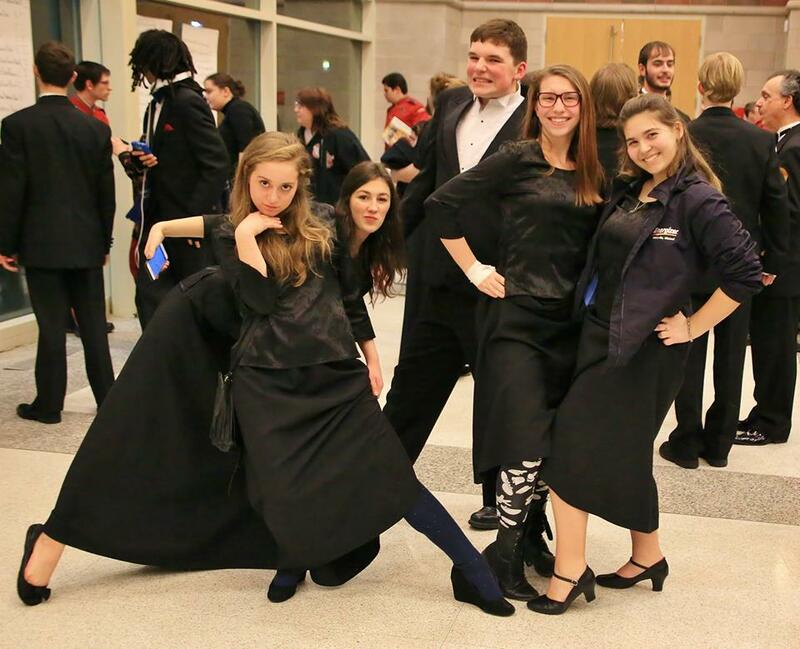 The band will also play Valdres, a Norwegian march written by Johannes Hanssen and The Seal Lullaby by Eric Whitacre. 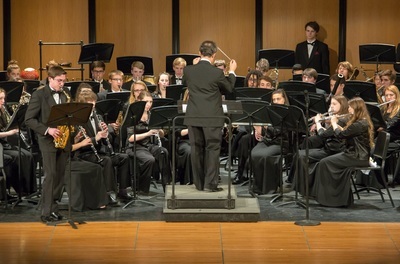 The Avon Lake Symphonic Band performed with the Patriots Symphonic Band on May 3rd, 2014 in the Avon Lake High School Performing Arts Center. The Director of the Patriots Band is Mr. Harry Pfingsten, Director of Bands at Avon Lake High School from 1964 to 1991. The comic strip writer, Tom Batiuk, used Mr. Pfingsten as his inspiration to create "Harry Dinkle", the famed comic strip band director! 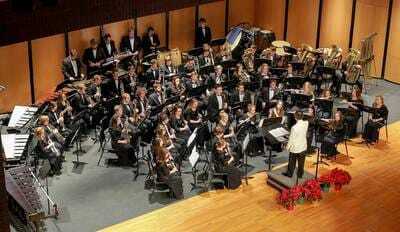 The Avon Lake Symphonic Band performed Arabesque in March, 2013 in Chicago's Orchestra Hall. 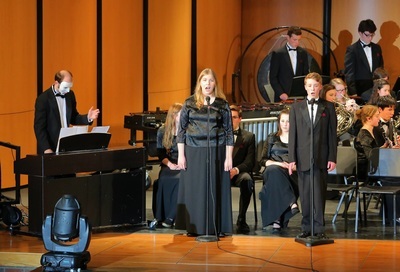 The band performed Chorus Angelorum in December, 2014. 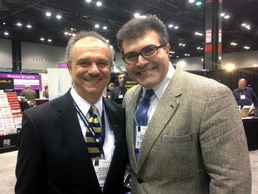 Pictured here are Sam Hazo and Mr. Eddleman at The Midwest Clinic in Chicago. Mr. Eddleman with John Mackey in Chicago. 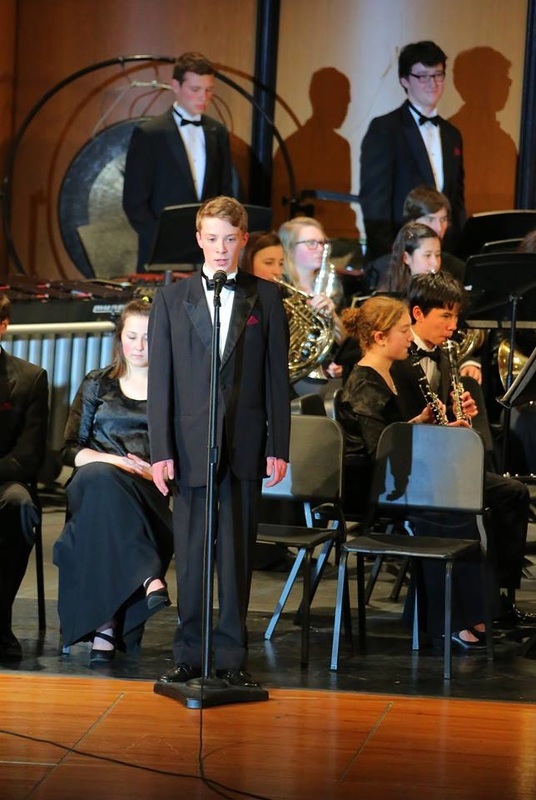 John Mackey's "Night on Fire" and "Foundry"
The Symphonic Band performed "Night on Fire", written by John Mackey, in the spring of 2015. 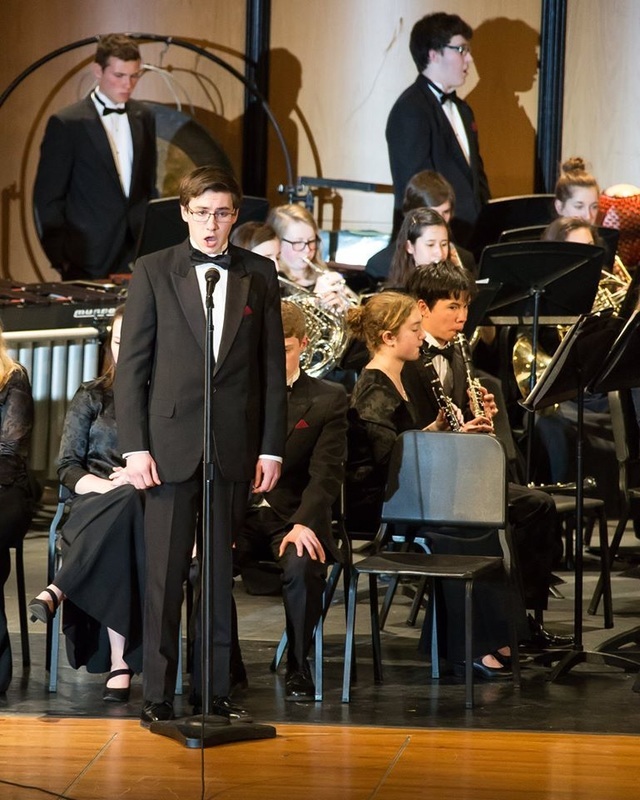 The Concert Band performed his piece entitled "Foundry" in May, 2016, with artwork projected onto the back of the stage shell. Students enjoyed both pieces as well as other music composed by Mackey, who, by the way, is a native of Ohio. 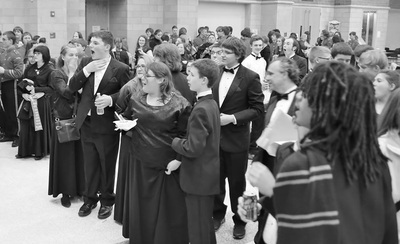 Mr. Eddleman met John Mackey at The Midwest Clinic in Chicago in December, 2014. 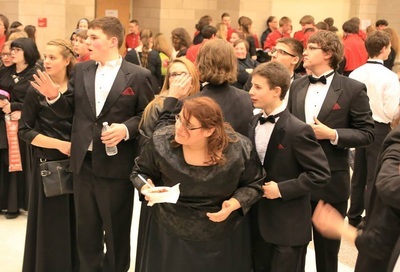 The picture is of Robert W. Smith, composer of Mekong, and Avon Lake Band Director David Eddleman, taken at The Midwest Clinic in Chicago. 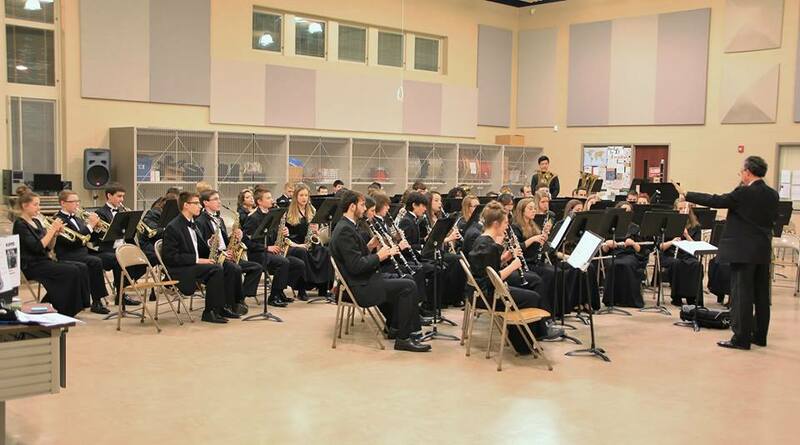 In the spring of 2012, the Avon Lake Symphonic Band performed Mekong, a powerful piece of music written by Smith about the Vietnam War. 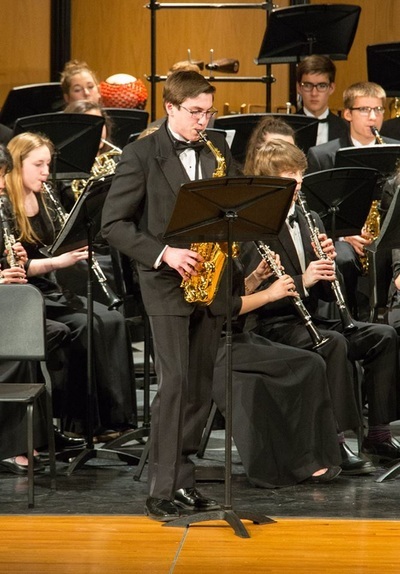 Eddleman discussed the piece two or three times with Smith over the course of the prep, discussing the use of a Vietnamese string instrument (played on synthesizer) and a hauntingly beautiful solo played on an Electronic Wind Instrument (EWI). 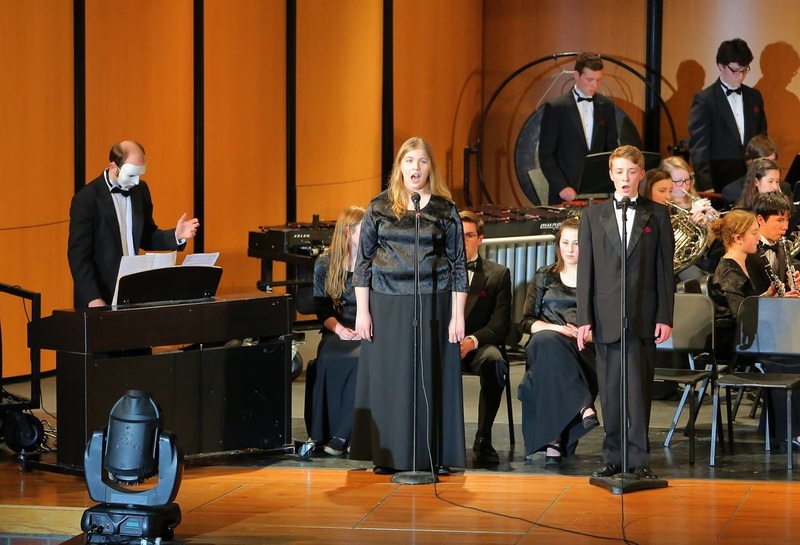 There were also special effects and synthesized sounds needed to create the sound of waves lapping onto the shore and helicopter sounds created from drum heads. 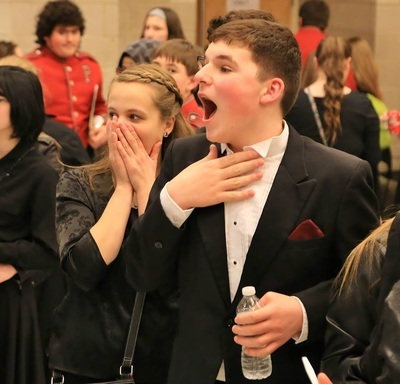 Eddleman said the band performed the piece three times, and each time receiving strong emotional reactions from the audiences...and a standing ovation! 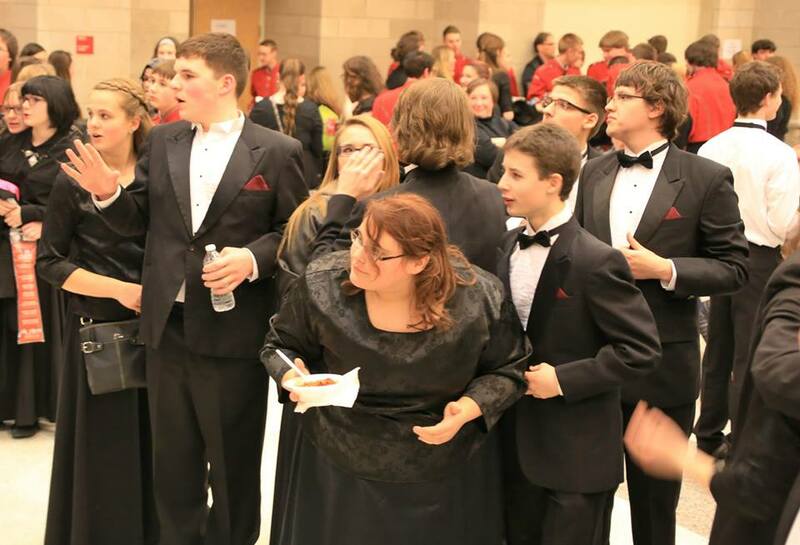 People were so moved by the piece that Eddleman still has students, parents, and community members asking if they will play it again! Interesting side note: Smith and Eddleman knew each other through their work in Drum Corps International, Eddleman as the Open Class Coordinator for DCI and Smith as the composer/arranger for DCI's Madison Scouts! 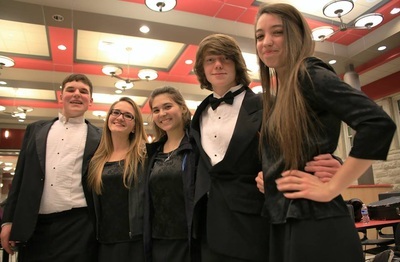 "The Avon Lake Symphonic Band, under the direction of Director David Eddleman, exhibits extremely high standards of instrumental music performance. 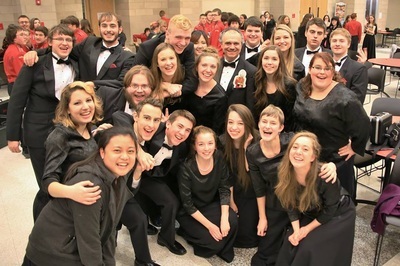 My work with these outstanding students as clinician and guest conductor at concerts over the years has been a very rewarding experience for me because of their talents, discipline, and eagerness to learn. Our performance together in Severance Hall, Cleveland, Ohio, was especially a thrill for me because of their sensitive musical performance of “Salvation Is Created”. Dr. John W. Knight is Professor of Conducting/Music Education at the Oberlin Conservatory of Music. 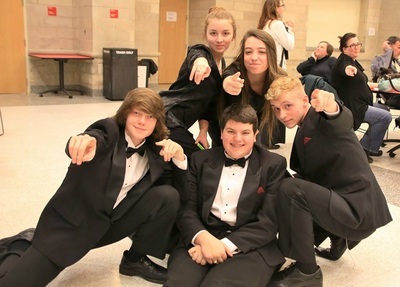 Symphonic Band seniors and Mr. Eddleman at Elyria HS. 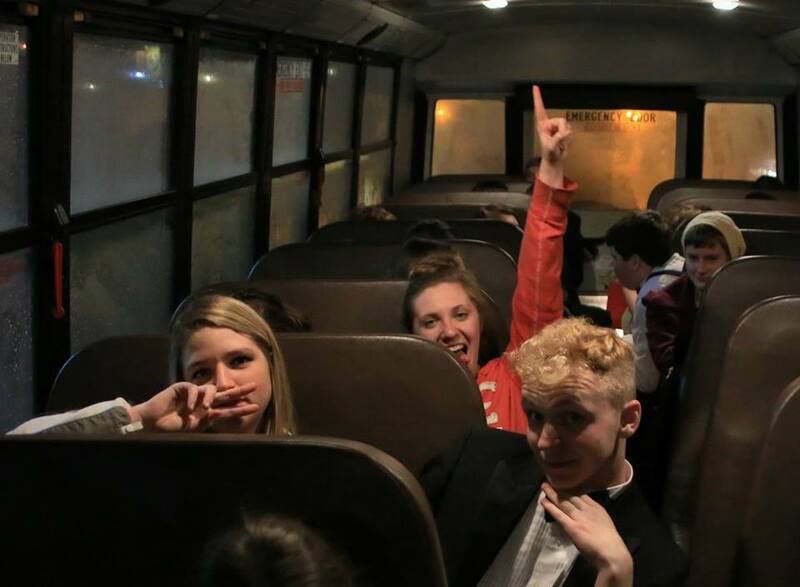 March 13, 2015 - The Avon Lake Symphonic Band came away from the OMEA District Band Contest at Elyria High School with a superior rating. 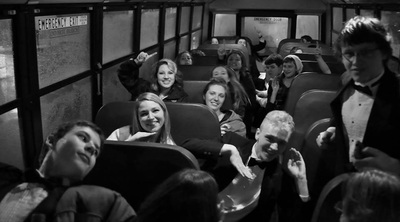 The band will advance to the Class A State Finals on May 1st or 2nd. 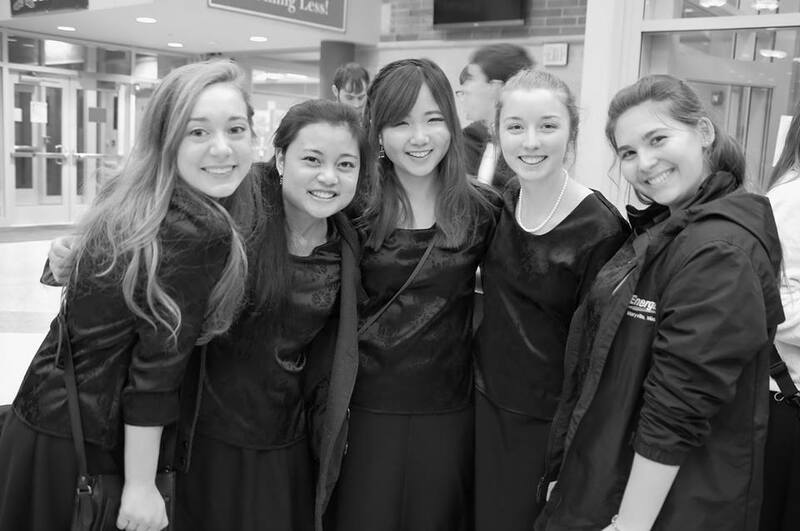 This year's contest repertoire included "On the Campus" by J.P. Sousa, "Variations on a Korean Folk Song" by John Barnes Chance, and "Night on Fire" by John Mackey. 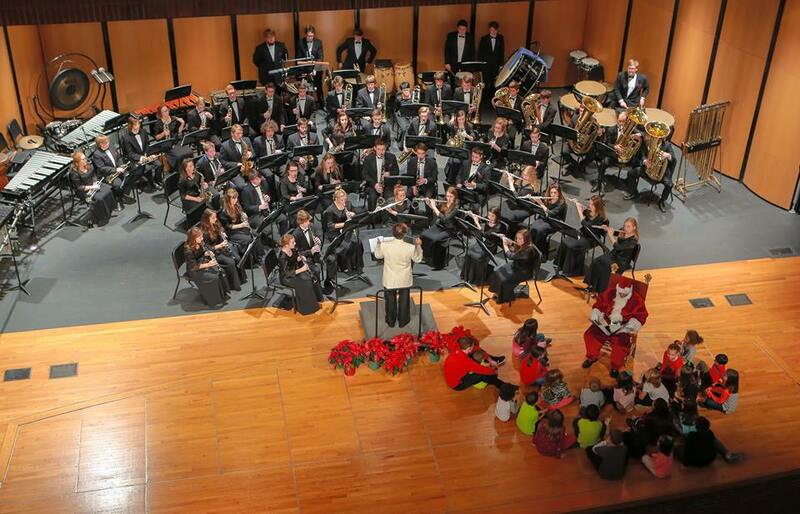 Congratulations to all of the members of this year's Symphonic Band! Dr. Gary M. Ciepluch is Director of Bands/Director of Music Education at Case Western Reserve University, conductor of the University Circle Wind Ensemble, and founder/conductor of the Cleveland Youth Wind Symphony. 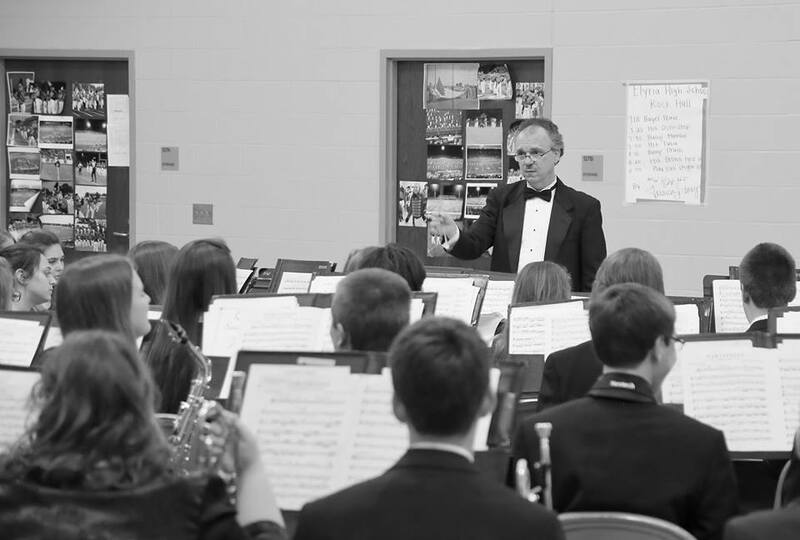 Howard Meeker is Professor of Music and Director of Instrumental Music at Cleveland State University. 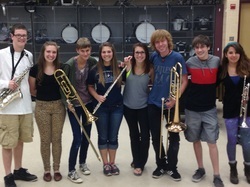 Ten Avon Lake Band students were selected to perform in the Cleveland Youth Wind Symphony for the 2014-15 school year. Pictured are: Anna Phillips, Braeden Loveless, EJ Wennerberg, Brennan Thomas, Nicole Ziemba, Ryan Jaeckin, Jordan Laird, Ashley Bradley, Sarah Mills, and Ilana Shapiro. 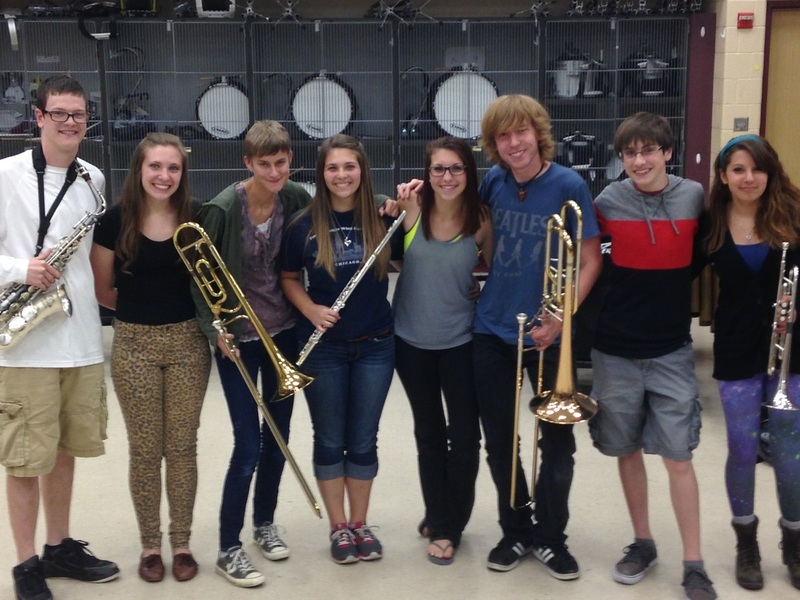 Nine Avon Lake band students were selected to perform with the Cleveland Youth Wind Symphony in 2013-2014. 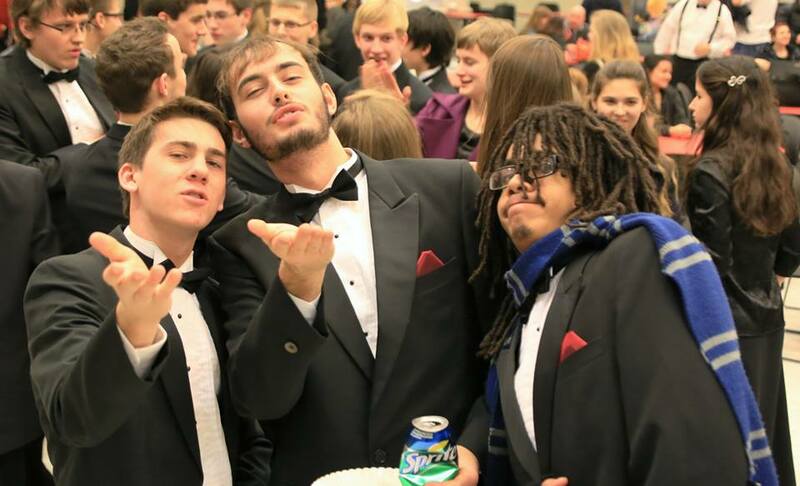 The CYWS is based on the CWRU/CIM campus and performs in Severance Hall. 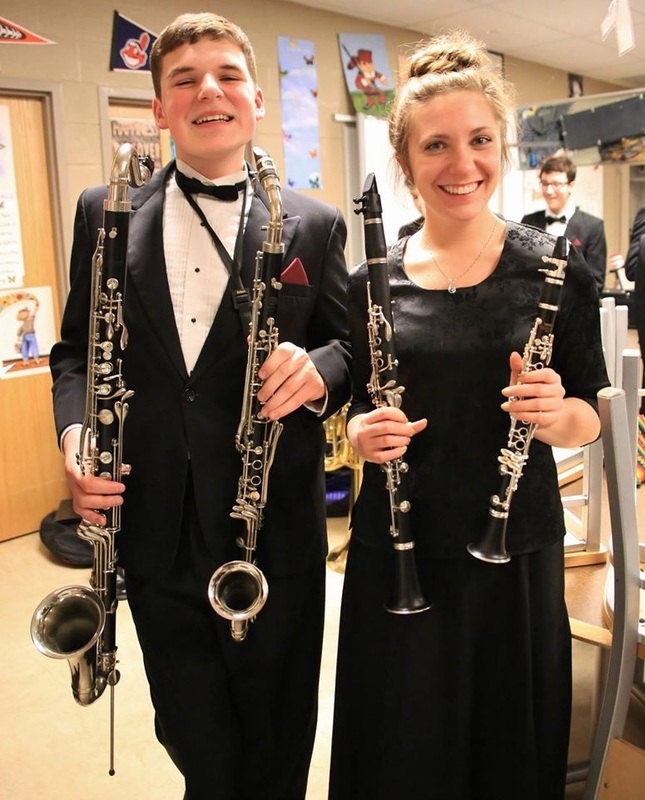 Avon Lake students in the ensemble this year are: Kyle O'Malley, saxophone; Ashley Bradley, clarinet; Jordan Laird, trombone; Sarah Mills, flute; Mackenzie Miller, oboe; Tad VanNostran, trombone; EJ Wennerberg, saxophone; Ilana Shapiro, trumpet; and Adam Litzler, percussion (not main.phppictured). 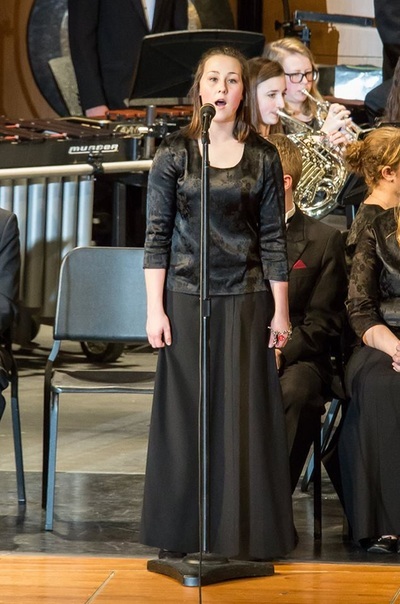 OMEA District Band Contest, March 2015.